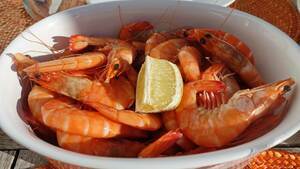 Shell-on prawns make a wonderful starter. Simply grilled and served with bread and lemon wedges is simple cooking at its finest. 1. Heat a griddle pan over a high heat, or a frying pan over a medium-high heat. 2. Sprinkle the salt over the pan. 3. Lay the prawns in the pan and cook for a couple of minutes. 4. Flip the prawns over and pour the oil over the top. 5. Cook until the prawns are completely opaque. 6. Serve with bread and lemon wedges.